This is the first in the "Daughters of Erin" trilogy by Laurel McKee, aka Amanda McCabe. Eliza Blacknall and William Denton grew up together in Ireland, best friends who found themselves falling in love. They are both from English families, although Eliza embraces her Irish home more fervently, loving the Irish people in her community and enjoying their legends and folklore. They are torn apart by Eliza's having to marry a count and Will's joining the British army. Seven years later, and Eliza is a widowed countess living in Dublin, involved in the Irish movement that eventually culminates in the 1798 uprising. Will returns as a commanding officer, and they find themselves once again falling for each other despite being on opposite sides of the Irish rebellion. 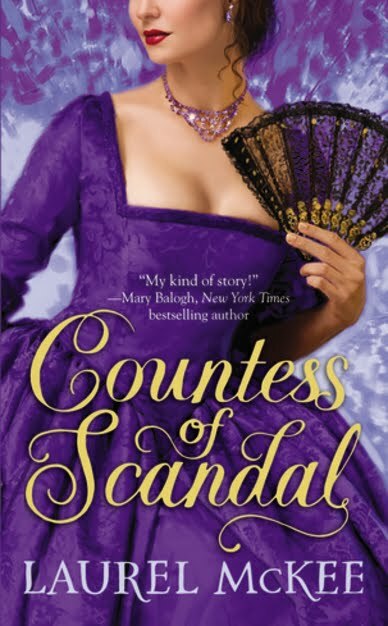 I love the time period just before the Regency, and it is refreshing to read a story set in Ireland rather than England. The whole story had an Irish Scarlet Pimpernel feel, and there's even a daring escape with disguises as the aristocracy flee the countryside for the safety of Dublin. I really liked the historical aspects of this book - it's very much a political book, which may weigh it down for those not enthused about history. The romance I felt was a bit on the warm, rather than hot, side. I usually enjoy the "childhood friends become lovers" trope, but I felt like it was such a foregone conclusion that they loved each other deeply. I usually prefer a bit more tension before they hop into bed and declare their love. Overall, I found this to be a pleasant (rather than page-turning) read.